#17 - P/1B/3B 6'2" 250 lbs. Zack is currently in his 2nd year with the Raiders. He will mostly hold the fort down at First Base, while contributing power at the plate. #11 - P/ UTIL 5'10" 180 lbs. This is Nolan's first year as a Raider. He has already proven himself competent on the mound and at the plate in his first half season. #22 - P/3B 6'3" 210 lbs Sully is now in his second year as a Raider. He has proven himself quite the power hitter in this past fall, and far from a liability in the field. 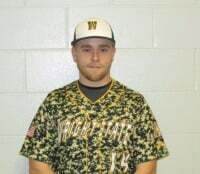 #10 - P/3B/1B 5'10" 230 lbs Big Richard Nolde will be returning next fall due to academic endeavors. He is a strong contributor and we cannot wait to have him back! #14 - P / UTIL 5'10" 190 lbs First year President of the Raiders, Nick is a strong top of the rotation pitcher and a good hitter for average at the plate. Site Property of Wright State Club Baseball.